The Sunshine Village Ski Resort at Lake Louise in Banff National Park in Alberta, Canada. Enjoy a day on the uncrowded slopes at the Sunshine Village Ski Resort in Banff National Park in Alberta, Canada. The ski season at Sunshine Village Resort usually begins in the middle of November right up until the end of May. Sunshine Village Ski Resort in Alberta, Canada is a magnificent place to spend some unforgettable days on the spectacular snow covered slopes. Sunshine Village Ski Resort, Lake Louise, winter, Banff National Park, Alberta, Canada, North America. 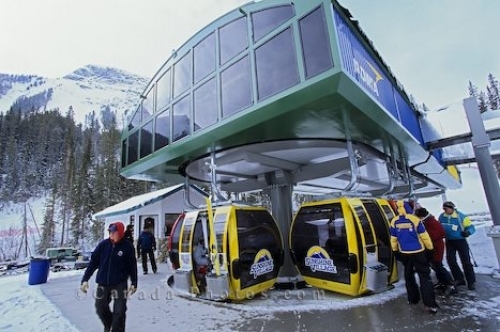 Photo of the lifts at the Sunshine Village Ski Resort at Lake Louise in Alberta, Canada.